Blase Bold in the Lord And Spiritually Excited, pronounced, 'blaze', is the acronym for the group. It is the perfect description for three young ladies who are on fire for the Lord. 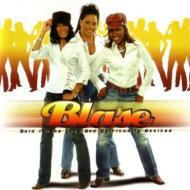 The group Blase was spiritually ignited in 2002 by Keschia Smith-Jones, a God gifted singer and songwriter from Houston, Texas. Her vision of having a female group with perfect harmony and a powerful ministry was first manifested in 2001 with the five member female group 'Grace'. Spiritually led to go in different directions, two members left the group, and continued to serve God in their own individual ministries. However, this did not douse the flame that was in Keschia and the two remaining members. Just like that fire that was shut up in Jeremiah's bones, the three burned with the desire to fulfill God's promise. Keschia, along with Sharletha Woodard and Michelle York, who are also from Houston, Texas, make up the present group Blase. Awesomely anointed, Keschia, Sharletha and Michelle melt their beautiful voices into a rich three part harmony that soothes the soul and glorifies God. Each member of Blase brings with them a wealth of talent and experience. Keschia started singing and playing the piano at an early age and was nurtured spiritually at her home church of St. Agnes. She has been a member of several Houston area choirs and groups, which includes the Southeast Inspirational Choir and Yolanda Simmons-Jones and Purpose. Keschia has also backed up notable gospel heavyweights Nakita Clegg, Richard Smallwood and Donnie McClurkin. Keschia also shares her gifts at Cummings Elementary School as a music teacher. A long time friend of Keschia's, Sharletha Woodard also comes from St. Agnes. She has stirred up the gift that was in her since she was a little child. Also noted as a gifted singer and songwriter, Sharletha has had experience singing with various Houston area choirs, which included Yolanda Simmons-Jones and Purpose, the Crew and L.O.C., and the St. Agnes Church Choir. Michelle York is the embodiment of those 'big things' that are said to come in small packages. Michelle's dynamic vocals are matched only by her spirit for praise. Getting her start at Gospel Hill Baptist Church, Michelle has continued to glorify God. She sang background for Rise Joiner, John Calhoun, and Nakita Clegg. And though small in stature she is large with God's anointing. All three members of the group also performed in a stage production by Leona Daniels called 'In The Father's House'. Blase has a new traditional gospel sound with an old traditional gospel message, and make themselves available to minister to all.